Newburyport is Massachusetts' smallest city, with a population of 16,500. In the eighteenth and nineteenth centuries, the city -- about two miles from the mouth of the Merrimack River -- was a center for shipbuilding and maritime trade. The first revenue cutter commissioned by the federal government was built there in 1790 by shipbuilder William Searle. This has earned Newburyport a claim to the title "Birthplace of the Coast Guard." 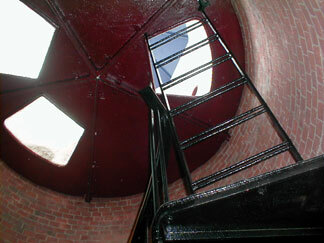 The Newburyport Harbor Range Light Station was established in 1873 to help mariners entering Newburyport Harbor. There may have been some form of range lights in the vicinity as far back as 1790. Two range lights to guide up the River Merrimack to the city of Newburyport have been established in the same position as the private lights before maintained by subscription, and were lighted June 1, 1873. The front light is on an iron tower, conical in form, 14 feet six inches high, located on Bayley's new wharf, and the focal plane is 25 feet above the sea. The rear light is about 350 feet... from the front light, on a brick tower, pyramidal in form, 32 feet high, and the focal plane is 47 feet above the sea. In addition to serving as a guide into the harbor, the lights helped vessels avoid a dangerous reef called Goose Rocks. The front range light was altered early in its history, when a shingled, hexagonal wooden section was added to the top of the cast-iron tower. The rear tower was raised to its present height of 53 feet in 1901. The upper wooden part of the front tower was similar in appearance to the Doubling Point Range Lights on the Kennebec River in Maine. This section was later raised by several feet making the tower's total height 35 feet. There was never a keeper's house built for the range lights; men who lived nearby were hired as keepers. Later, for some years, the keeper at the light station a few miles away at the northern tip of Plum Island had the added duty of caring for the range lights. The range lights were discontinued in 1961. It has often been stated that the front range tower was moved a short distance to the grounds of Coast Guard Station Merrimack River in 1964. This has been proven to be incorrect. Although the Lighthouse Board reported that the front range light was located on Bayley's Wharf, it was situated on Deford's Wharf -- in the same place it stands today. According to Jesse "Skip" Motes, co-author of the monograph Harbor Range Lights, Newburyport, Massachusetts, states that there is "overwhelming evidence" that the tower has never been moved. The tower was later damaged by fire, and in 1990 it was changed back to a more traditional appearance with the restoration of its original iron lantern. After its decommissioning, the rear range light was bought by a private party. In 1999 the Lighthouse Preservation Society, then based in Newburyport, launched a $65,000 fundraising campaign to renovate the front range light. Some renovation and painting of the tower has taken place in recent years. Right: The front range light in the 1980s. Photo by Kenneth Kochel. Developer David Hall has been responsible for some refurbishing of the rear range light, which he owns on Water Street. The Lighthouse Preservation Society offers gourmet dinners at the top of the Rear Range Light; call (800) 727-BEAM for information. The Newburyport Harbor Range Lights are listed on the National Register of Historic Places. They are easily accessible by land. Newburyport, with its diverse architecture and countless shops and restaurants, is a favorite tourist destination. To help with the restoration of the front range light, contact the Lighthouse Preservation Society.